German and American scientists examined four thousand smokers and nonsmokers and found out, that the disposition to smoking and nicotine dependence is in our genes. Moreover, exactly this is the major reason of smoking, but not external factors or a bad example. 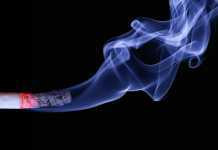 The research result of the experts from Bonn and Heidelberg Universities in conference with their colleagues from Harvard Medical School shows, that the genetic changes lead to the earlier dependence on cigarettes. The disposition to smoking is 50-75% conditioned by genetics. Such factors as stress and the bad example of the social surroundings are secondary, the scientists report. The researchers note, that the main role in getting the bad habit is played by two genes: when tryptophan hydroxylase 1 gene (TPH1) changes, the nicotine dependence shows itself much more and it is very difficult to get rid of it; when tryptophan hydroxylase 2 (TPH2) gene changes, the person starts smoking early. As the researches show, both these genes are connected with serotonin output. The lack of this hormone leads to depressions and phobias and is considered to be one of the causes of drug addiction. How to Apply Makeup Pigments?